The ‘Invest Sri Lanka’ Investor Forum organised by the Colombo Stock Exchange (CSE), the Securities and Exchange Commission of Sri Lanka (SEC) and the Singapore –Sri Lanka Business Association (SLBA) was held on 2 March (Friday) at the Four Seasons Hotel Singapore and made a strong case for investment flows into Sri Lanka. 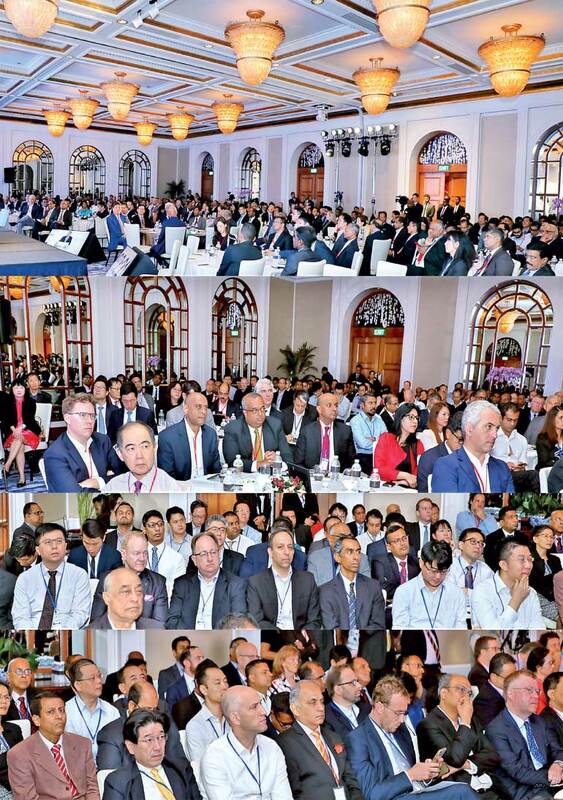 The event drew a strong turnout of leading Asia–based institutional funds and other investors across multiple industries and was graced by Prime Minister Ranil Wickremesinghe as the keynote speaker and the Minister for Trade and Industry in Singapore S. Iswaran. A Sri Lankan delegation including senior representatives of the CSE, SEC, the Central Bank of Sri Lanka, 17 listed companies and 12 stockbroker firms collectively pitched for further investment flows into Sri Lanka, a call that was also boosted by strong endorsements for Sri Lanka by the Singapore Business Federation (SBF), CHEC Port City Colombo, Shangri-La Hotels and Resorts, Aberdeen Standard Investments Asia and DBS Bank. “We know we can leverage on our strategic location to expand market access. Therefore we are expanding our trade and investment relationships with a diverse set of countries, such as the US, EU, India, China, Singapore, Japan, Malaysia, Thailand, and Indonesia,” Wickremesinghe added. “We are already starting to see the benefits of the Sri Lanka-Singapore Free Trade Agreement – the positive news surrounding the agreement has led to an uptick in interest from Singapore companies to partner Sri Lankan companies to invest in opportunities both within Sri Lanka, and to use Sri Lanka as a hub to expand into the broader South Asian region. Indeed, the strong turnout to this conference is testimony to the growing interest in opportunities in Sri Lanka,” Iswaran added. Central Bank Governor Dr. Indrajit Coomaraswamy, speaking on the economic outlook at the event, outlined a number of positive trends and developments experienced in the Sri Lankan economy, including record exports and inward direct investment in 2017 and stated that such developments provide the indication that Sri Lanka is beginning to benefit from the reforms implemented to stabilise the economy and foster growth. The Governor noted that there are certainly grounds for cautious optimism that the macro-economic trends in Sri Lanka are heading in the right direction. In addition, the Forum also featured a prominent line-up of other speakers including Sri Lankan High Commissioner in Singapore Nimal Weeraratne, Kuok (Singapore) Limited Chairman Kuok Khoon Ean, CHEC Port City Colombo Chief Sales and Marketing Officer Liang Thow Ming, DBS Group Research Chief Economist and MD Taimur Baig, Aberdeen Standard Investments Asia Managing Director Hugh Young, Softlogic Holdings PLC Investments Head Niloo Jayatilake, SBF Honorary Treasurer Lawrence Leow and SLBA President Angelo Perera. 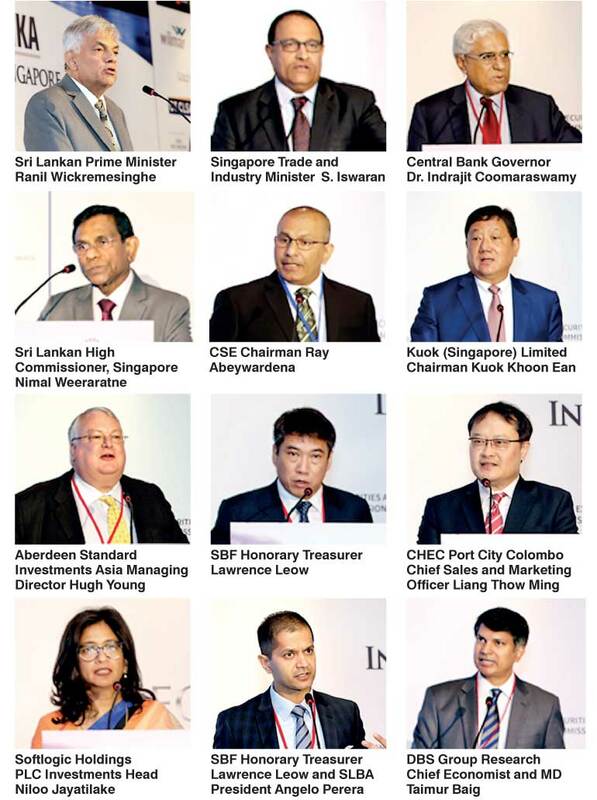 Central Bank Governor Dr. Coomaraswamy, SEC Director General Vajira Wijegunawardane, CSE CEO Rajeeva Bandaranaike and Softlogic Holdings Investments Head Niloo Jayatilake also featured in an engaging panel discussion moderated by the Institute of Policy Studies in Sri Lanka Chairman Dr. Razeen Sally. A series of investment focused, pre-scheduled one-on-one/group discussions between investors and participating Sri Lankan listed companies were also organised as a part of the Investor Forum, where a number of leading international and Asian institutional frontier market focused funds and other investors showed a keen interest in discussing the investment opportunities available in Sri Lankan listed companies. John Keells Holdings PLC, Commercial Bank of Ceylon PLC, Hatton National Bank PLC, Hemas Holdings PLC, Sampath Bank PLC, DFCC Bank PLC, National Development Bank PLC, Access Engineering PLC, Tokyo Cement Company (Lanka) PLC, Seylan Bank PLC, Lion Brewery Ceylon PLC, Hayleys PLC, Singer Sri Lanka PLC, Softlogic Holdings PLC, LAUGFS Gas PLC, Sunshine Holdings PLC and MTD Walkers PLC attended the events. The Invest Sri Lanka initiative in Singapore was supported by the Singapore Business Federation– Strategic Partner, DBS Private Bank Singapore – Platinum Sponsor, Capital Alliance Partners – Platinum Sponsor, Wilmar International Limited – Platinum Sponsor, BP de Silva Holdings– Platinum Sponsor, Acuity Partners – Gold Sponsor, Asia Securities – Gold Sponsor, Ceylon Guardian – Gold Sponsor, CT CLSA Securities – Gold Sponsor, Dwellings Group – Bronze Sponsor and the Oxford Business Group - Exclusive Publication Partner. The Sri Lankan High Commission in Singapore, the Singapore International Chamber of Commerce, the Singapore Indian Chamber of Commerce and International Chamber of Commerce Sri Lanka were Promotional Partners of the initiative. The Invest Sri Lanka initiative generated a keen interest in both the international media and the media in Singapore, where senior representatives from CBSL and the CSE strengthened Sri Lanka’s investment case through a number of interviews and media appearances during the period.